A full house for opening night of your latest production isn’t just good news for theatre revenue, it will inspire your cast, creatives and production team to put on their best show possible, whilst also creating a buzzing atmosphere for audiences. In densely populated areas of competition, such as Madrid’s Gran Via, London’s West End or Broadway, where audiences have hundreds of theatrical and musical options at their fingertips it can be tricky to ensure they choose your theatre over all the rest. The secret to a full house on opening night, and every night after that, is a carefully planned and data-driven marketing strategy. To achieve this, theatres must be making the most of digital resources in their marketing strategy: some still aren’t harnessing the full power of social media, leveraging ticketing solutions or creating genuinely innovative types of content. It’s time to transform your theatre marketing with this extensive guide to updating your theatre marketing for 2018. Before you start on your new theatre marketing strategy, be clear on what you want to achieve with it. There’s no use allocating time and resources to your marketing if they aren’t being used effectively to achieve a specific goal. This might be to sell more tickets, it might be to increase traffic to your website, it might be to gain more of a following on social media. Make your targets measurable and realistic, and track your progress as your show shoots to fame, so you can evaluate and adjust your strategy to improve its performance. Each production will have a different target market, different unique attraction, and therefore will each require their own tailor-made approach. The days of blanket, non-targeted marketing are long gone. When promoting a production or event at your theatre, you’ll need to design a strategy for each show individually based on who will be interested in it and what kind of work it is. For instance, a large scale, family Broadway musical needs very different presentation to an intimate adaptation of a Shakespearean tragedy. To gain a better idea of the production itself, before kicking off on your marketing strategy, sit down with the director, producer, actors or writer if possible to gain a deeper insight into the product you’re promoting. They will know the production best: what’s new about it, what it offers audiences, what’s appealing about it and who it’s aimed at. You can use this information to structure a carefully targeted marketing strategy around the show itself and its particular target audience. Theatre marketing can be a tough game. Audiences seeking a night out at the theatre in a big city like Madrid have a number of options available to them, and making your production stand out from the noise can be a challenge. That’s why before designing your new marketing strategy, if you don’t have competitor information already, competitor research is key. Identify around 3-5 key competitors and look at the channels they’re using, the kind of content they make, how they communicate with audiences on social media and learn from them. Pinpoint what works well and what doesn’t, what you think could work for your theatre and what doesn’t fit with your targets and character. To stay competitive in this ever-evolving industry, it’s crucial to keep an eye on the tools and techniques your rivals are using in their marketing efforts, and monitoring these over time to be aware of any key evolutions or developments. Some might say that email marketing is dead. In fact, it’s an invaluable resource for keeping semi-regular theatre-goers on board, for delivering useful and interesting content to your customers and selling more tickets. If you don’t already, set up a newsletter sign up call to action on your website, and send a weekly or bi-weekly email to your subscribers. Try not to think of this as ‘selling’ your theatre, but as ‘giving’ your audiences something valuable that means they want to continue their relationship with your theatre. That could mean a collection of interesting articles about the state of theatre in your city, industry news or trends or recommendations to other productions or theatres you think your customers might like. Be sure to break up your text with images and videos. Remember – it doesn’t always have to be about your theatre and promoting it directly. Deliver something genuinely helpful to your customers every week and before long you’ll see occasional customers become regulars at your shows. Make sure your marketing strategy is grounded in an understanding of your customers. There’s no use taking steps in the dark without a detailed understanding of customer behaviour, trends and patterns. A Ticket Distribution System, which can provide you with real-time sales insights, and a CRM software, which can feed you with marketing data, will inform your marketing strategy, help you pinpoint opportunities and risks, and ultimately make your strategy more effective. For instance, a centralised ticket management system could alert you to the fact that more tickets are sold on particular days of the week. If you’re running a short-term competition, discount, or giveaway you can leverage this data to time this promotion to boost quieter days of sales, or to land on days you know customers are more likely to make a purchase. If your theatre isn’t leveraging the full power of social media marketing, you’re missing a trick. In fact studies show that in comparison to cinemas and music venues, theatres are often behind the curve when it comes to using social media to get the word out about their productions and unique offering. A great place to start is by identifying a memorable hashtag for your theatre, and for each production you’re running. Use it when Tweeting or Instagramming about your latest production, and encourage your audiences to use it when they take to social media after the show to rave about it by handing out cards with the hashtag on them as they leave the theatre. This simple approach will help generate a buzz around your theatre, increase interaction between your theatre and your audiences, and enhance your online presence too. Recent years have seen an explosion in video marketing. With all the visual spectacles being created on a day-to-day basis in your theatre, you’d be foolish to miss out on the opportunity to create some dynamic videos to promote your theatre. In a recent survey of businesses using video marketing, 76% of respondents said it helped them increase sales. Think teaser videos of upcoming productions, interviews with audience members as they leave the theatre, rehearsal videos, or a behind-the-scenes tour of your theatre’s backstage and teams. These can then be promoted on your blog, social media and newsletter. Studies show that 85% of people say they’d like to see more video in 2018, so give the people what they want! High-quality videos can be a great asset to your theatre marketing. In this digital age, it’s easy to forget the simple but effective power of print marketing. Who can forget the Book of Mormon’s iconic campaign which saw ‘The Mormons Are Coming’ splashed across London newspapers and station poster boards at rush hour as ‘Mormon mania’ took over the capital? We learnt from this famous campaign that a bold design, emotive catchphrase like ‘The Mormons Are Coming’ and carefully positioned print such as posters, print ads in magazines and newspapers, flyers and cards can make a huge impact, in particular if you’re targeting a specific geography. By combining print and digital marketing approaches, for instance in adding QR codes to your print marketing which trigger a link on a smartphone when scanned, you can maximise your audience and reach more people with your theatre marketing approach. Getting the word out about your theatre means making sure customers can purchase tickets and find information about your shows in a matter of clicks. If information and tickets about your theatre are only available on your site alone, customers might simply choose a different production or event they can book for using their favourite trusted ticketing channel. External ticketing channels can also provide customers with packages which pair your theatre experience with a hotel stay or pre-theatre dinner. Therefore, be sure to leverage the power of ticketing channels such as Atrapalo, Ticketmaster, Ticketea, Lastminute.com or Londontheater.co.uk to ensure your theatre marketing connects with the widest audience possible. This might seem a lot to manage, but leveraging a ticket distribution system (TDS) can help you monitor multiple ticket channels at once via a centralised platform to maximise impact. On average, audiences in the UK listen to 6 hours of podcasts a week. As an emerging form of content which is growing in popularity year on year, this is a great opportunity to make your name in an up-and-coming space. Your theatre’s podcast could feature interviews with directors, actors, producers and designers, discussion about trends in the theatre scene and reviews about other productions your team have seen and enjoyed. Podcasting is relatively low-cost and by delivering interesting weekly audio content, you can build lasting relationships with potential audience members who will be inspired to check out your latest production after they’ve heard an actor’s perspective on it or a director’s vision for it. Increasingly, in particular if you’re looking to attract a younger crowd, customers’ booking patterns and behaviours are influenced by social media, and influencers in particular. Inviting carefully selected influencers to your theatre to see a production could allow you to reach new audiences and build awareness of your theatre. Choose with caution: invite those that post about theatre or cultural events since their followers are more likely to be interested in what your theatre has to offer. Make sure to choose influencers whose followers are based in your area, and always select someone with a small niche of dedicated followers over a figure with a large number of followers that may not be interested in hearing about your theatre. In return for a free ticket, they’ll blog, post or write about their amazing experience at your theatre, building a buzz and increasing awareness. Free publicity for you, and free ticket for them: everybody wins! In the highly competitive theatre industry, an unbeatable marketing strategy needs to leverage social media and digital tools to their full advantage to boost awareness, increase traffic and generate ticket sales. These tools can mean the difference between the curtain going up to a half-empty theatre, or a buzzing full house night after night. 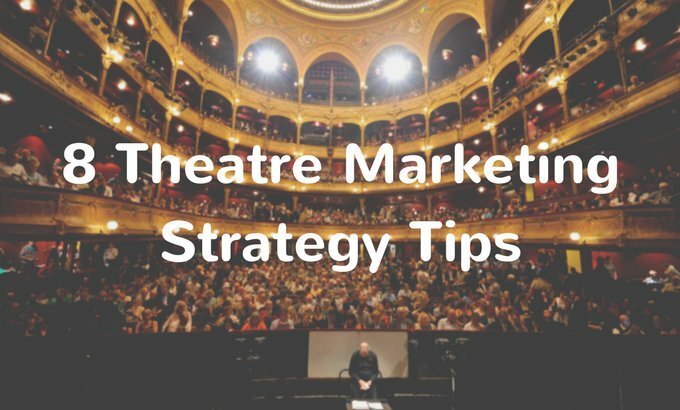 These tips to modernise and optimise your theatre marketing will help you bring your theatre marketing into the 21st century and increase sales. To further streamline ticket sales for your theatre, Onebox brings you a global ticket distribution system which provides you with real-time data insights, channel management, an improved purchase flow for customers, and business intelligence to empower you to market your theatre more effectively.